COFFIN JOE IS BACK! Those are the only words I needed to hear to get excited for this release, the final piece of the Coffin Joe trilogy started in 1964 with the classic At Midnight I'll Take Your Soul and 1967's This Night I'll Possess Your Corpse (which I regrettably still have not seen). Embodiment of Evil was originally released in 2008 and was finally released in the US by Synapse Films on March 29th. But can it hold up the originals? Most fans would fear after such a long hiatus that this would be nearly impossible. We'll see. Embodiment of Evil takes place 40 years after the supposed death of Coffin Joe (aka Zé do Caixão aka Josefel Zanatas - read the last name backwards). We soon find out that Joe has actually been in a heavily guarded prison for the last 40 years and is to be released. Though many people are against this, Coffin Joe is let go and instantly begins his evil ways. Accompanied by his servant Bruno (Rui Rezende) and a group of devoted followers, Joe continues his lifelong goal of finding a woman to bear a son for him. Soon the police, as well as relatives of some of Coffin Joe's previous victims are out for revenge and to put a stop to the inevitable bloodshed once and for all. 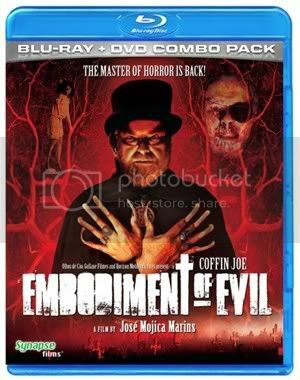 Jose Mojica Marins (who also directed and co-wrote the film) makes a welcome return as Coffin Joe in this long awaited sequel. Marins doesn't miss a beat in portraying the "Embodiment of Evil" in this grisly tale of psychedelic horror. All the nastiness from his previous performances is still there (even more so actually), as are those long fingernails! *shiver* Those things creep me out! Vividly filmed in color (with some black and white mixed in the form of flashbacks and hallucinations), Embodiment of Evil's picture pops off the screen. Also on display are some really sickening scenes of gore (entrails, eye gougings, impalements and much more!) that bring Coffin Joe into the 21st century. Armed with a delightfully macabre script and a strong cast of victims, this film proves to be exactly what Coffin Joe fans have been waiting for. Even those who haven't seen the previous CJ films will be able to follow along with his back story explained in detail. Synapse's new DVD/Blu Ray combo release is impeccable featuring a crystal clear picture, 5.1 surround sound and a nice helping of bonus features including a making of featurette, footage of Marins at the Fantasia film festival and a trailer).